Images and ideas associated with masculinity are forever in flux. In this book, Donald Moss addresses the never-ending effort of men—regardless of sexual orientation—to shape themselves in relation to the unstable notion of masculinity. Part 1 looks at the lifelong labor faced by boys and men of assessing themselves in relation to an always shifting, always receding, ideal of "masculinity." In Part 2, Moss considers a series of nested issues regarding homosexuality, homophobia and psychoanalysis. Part 3 focuses on the interface between the body experienced as a private entity and the body experienced as a public entity—the body experienced as one’s own and the body subject to the judgments, regulations and punishments of the external world. The final part looks at men and violence. Men must contend with the entwined problems of regulating aggression and figuring out its proper level, aiming to avoid both excess and insufficiency. This section focuses on excessive aggression and its damaging consequences, both to its object and to its subjects. 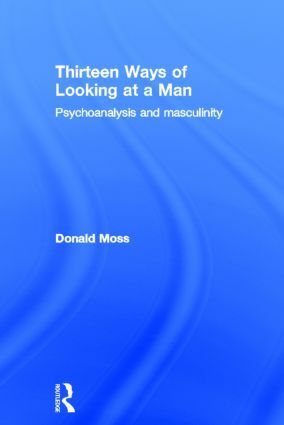 Thirteen Ways Of Looking At A Man will be of great interest not only to psychoanalysts and psychotherapists, but also to a much wider audience of readers interested in gender studies, queer studies, and masculinity. Bass, Foreword. Prologue. Masculinity as Masquerade. Immaculate Attachment vs. Passive Yearning: On Being and Becoming a Man. First Aside: Ted. On Neither Being Nor Becoming a Man. Two Ways of Looking Back. Psychoanalysis and Male Homosexuality/ The Ideal of Neutrality. Internalized Homophobia: Wanting in the First-Person Singular, Hating in the First-Person Plural. On Situating Homophobia. Freud’s "Female Homosexual": One Way of Looking at a Woman. Second Aside: Little Richard. Looking at a Transsexual. War Stories. Epilogue.